We spent just enough time in Lima to have a brief look at the small historic city center. 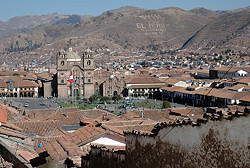 Afterwards we took a coach to Cuzco where we have stayed for three days as part of out altitude acclimatization. Even though it is a very much a tourist place, it still somehow manages to be a pleasant and nice city. The first trek in the Ands is always an acclimatization one. 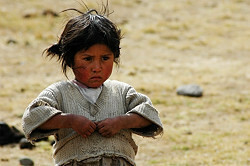 Ours took us from the village of Mollepata all the way to Machu Picchu. The first two days we were climbing from less than 3000 meters into a saddle at almost 4700. Afterwards we descended to "only" about 2000 meters where bananas and oranges were growing. This was a six day trek around Nevado Ausangate (6372m) in Cordillera Vilcanota range, almost all the time above 4000m. 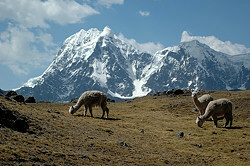 According to ancient Indian legends the mountain was the place of origin of llamas and alpacas and is still the source of their health and fertility. Even if that is a myth, the range is packed with them and they are apparently doing very well. Illampu Circuit is the only trek we did in Bolivia. 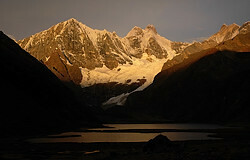 It is a six day circuit around Nevado Illampu (6368m) and Jankohouma (6429m) that winds through several wide and deep glacial valleys and a few passes. Even though it was often cloudy still there were interesting things to see. The circuit begins and ends in Sorata where witnessed a local festival. 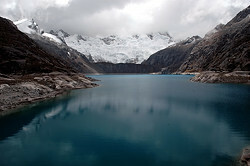 This circuit in Cordillera Huayhuash was definitely our best trek on this journey. We left the road with food for 14 days on our backs and started to climb a long valley in order to walk around all of the marvelous mountains in this range. 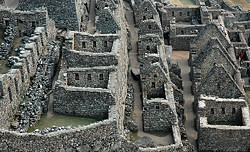 The sceneries were overwhelmingly spectacular and offered everything one would hope for in the Ands. The final trek we wanted to do was situated in Cordillera Blanca range and promised a close look at Huascaran and Alpamayo. Unfortunately, the dry season was almost over and constant rain is fairly unpleasant at altitudes close to five thousand meters. There was little hope for any improvement anytime soon and so we gave up after the first ascent.